Eralis Job allows you to streamline the necessary management of your service jobs so your team can spend more time delivering service to your customers. When it comes to performing service jobs, you have a lot of moving parts. Eralis Job allows you to simplify your processes and perform the necessary administrative activities more efficiently. So, you and your team can focus on what matters – delivering top level service to your customers. 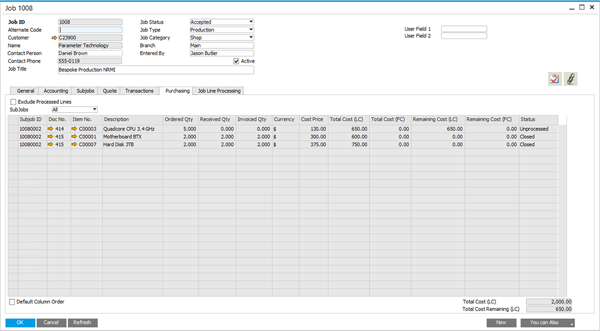 Save time on inventory or material allocation with automated functions that analyze requirements for each job, then create the necessary purchase orders or material issues. With default sell rates for specific people, materials and equipment, creating new quotes is quick and easy. Ensure costs for purchased materials are allocated to the proper job for more accurate job costing. Easily link service events to their related contracts or equipment so you have quick access to the complete service history. This visibility allows for in-depth analysis of services performed compared to contract value. Manage your service jobs more efficiently with the Eralis Job Suite of solutions. Get in touch with a partner in your area to setup a demo.